In the past two seasons of Lectio Divina with Archbishop Thomas Collins, Toronto’s chief shepherd has meditated on the Sermon on the Mount and the writings of St. Paul. The third season premiers this weekend, with the Archbishop reflecting on the Parables of Jesus. The Sower, the Prodigal Son and the Good Samaritan are among the parables that Archbishop Collins will explore over the next ten months. The season premiere focuses on the parables of the Kingdom of Heaven being like a Hidden Treasure, fine pearls, and a net let down into the sea, as found at the end of Matthew Chapter 13. 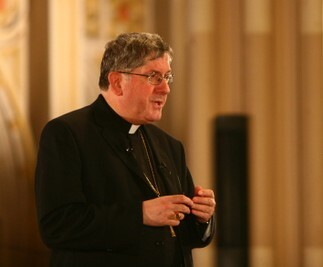 Visit our Lectio Divina with Archbishop Thomas Collins page for full details on upcoming episodes. Also, this year the Archbishop will begin each Lectio Divina with Compline, rather than Vespers. In this episode he provides a brief explanation of the Liturgy of the Hours and of Compline. Unearth the treasure of wisdom that is found in our Lord’s parables, and join us for the broadcast edition of Lectio Divina with Archbishop Thomas Collins: The Parables of Jesus, Sunday, September 20th at 9pm ET with an encore presentation Wednesday, September 23rd at 8pm ET, only on Salt + Light Television!